When it comes to Cassette-to-SFP MTP/MPO Fiber Optic Cables for connecting your SFP+ transceiver to an MTP style MPO cassette, Cables Plus USA has everything you need. We offer a variety of MTP to LC fiber cables, available in Singlemode, as well as OM1 to OM4 Multimode. Choose from 12 and 24 strand configurations to handle your 40Gb applications. Our Cassette-to-SFP cables come in a Rollover polarity, are made in the USA in our Richmond, VA manufacturing facility, and are thoroughly tested to ensure that they meet the highest quality standards for insertion loss and interferometry. Additionally, as LightWave brand Cassette-to-SFP MTP cables are made in the United States, they are fully compliant with the Trade Agreements Act (TAA), allowing for United States Government use. 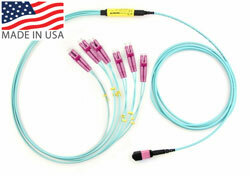 Tackle high bandwidth demands with the greatest of ease using these Cassette-SFT MTP/MPO Fiber Optic Cables.